LCN is a toe nail correction product that comes in a range of colour options to cover a variety of problems, i.e cracked or fungal nails. Nails look and feel completely natural, so look no further – try Wilde-pedique. It is an extremely elastic UV gel which when it is exposed to UV light sets. 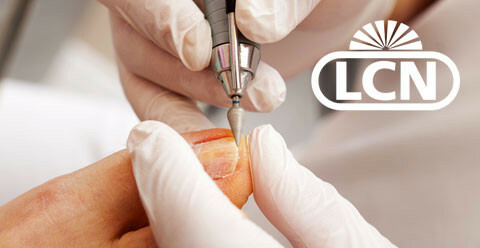 LCN pedique was developed specifically for a corrective and restorative toe nail treatment. The gel has the ability to bond to a surface, add strength with a glossy finish, whilst at the same time adapting to the movements of the toe due to its flexibility. Who would benefit from the Wilde pedique treatment? Fungal nails. This can be used in conjunction with fungal nail treatments either topical or oral form. Although Wilde-pedique is not a cure in itself, it should help limit the spread of the infection and will certainly go along way in boosting ones confidence in being able to show off their feet. Nails damaged by trauma: This prosthetic nail overlay may help the nail regrow into place, provide a cosmetically pleasing appearance to the damaged nail. Cracked and or split nails: LCN gel helps further damage by covering the crack or split hence preventing further snagging and also enhances appearance.